In most cases you may not even see the XLS extension. Do you know the meaning of Compatibility Mode? You are using a new version of Office but you have opened an older version file. Therefore, Office is downgrading itself and behaving as though it was Office 2003! In short, you are not going to get most of the new features of the new version. 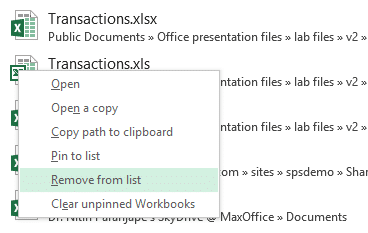 For example, even if you have Excel 2013, you will get only 65000 rows, not 1 million rows. Like this, hundreds of new features will either be disabled or work partially in compatibility mode. This is easy. As soon as you open a file – check if it is showing compatibility mode. Even if file extension is not shown, compatibility mode will be shown for older files. File – Save As – Save in the new format. For Word and Excel, the Compatibility Mode goes away as soon as you save the file in the new format. Problem solved. In case of Excel, one more step is required. Close the file and reopen it. Now the problem is solved. Absolutely genuine problem. But that does not mean you should not get benefits of the new version you already have. So the idea is simple. While you are working on the file, use it in new format. Just before sending it to the customer, save it as a copy in old format. What did you just do? You opened an XLS file, Saved it as XLSX and reopened it. Now in your File Open list, both files are seen – which is very dangerous. While opening the file, you may open the older file and edit it without realizing it. Worse still, you may edit both files at different points of time and then get completely confused in life. So what is the solution? The list of recently opened files gets flushed out as and when more files are opened. But keeping both (old and new) files visible there is undesirable. Changing the file to new version is definitely a good decision. But it has one disadvantage – it changes the file name. Therefore, if this file is being used by another file in a link, that link will still point to the older version file. This can lead to dangerous situation of you viewing outdated data in the linked file. That is why you have to check if the file you are about to convert is linked to any other file. Unfortunately if another file is linked to the current file, the linkage information is in the linked file. So there is no technically sure way of finding out linkages. You will have to rely on your (or your team’s memory) for this. If you find files which are linked to the current file, you must change the linkages. This is done by going to File – Edit Links – Select the linked file – Change Source – Choose the new format file. Users can convert files to new format one by one – as and when they open old files. But for corporate repositories, you need a heavy duty bulk conversion tool. This tool is called OMPM (now superseded by Office Telemetry). Go to TechNet Office Resource Kit for details. Very useful. This subtlety is most missed “feature”. Microsoft should have a warning “New features will be unavailable” or something. Yes Yatin. I will try suggesting it to the product team.